One of the quickest routes to fame and celebrity status is through marriage which most times come off as a success or a scandal – the latter also serving as a propeller to the popularity of the less popular spouse. The above assertion is true for the late Larry Fortensky who got himself famous somewhere in the middle of the two extremes above. He was notably the 7th and last husband of British-American actress, businesswoman and humanitarian Elizabeth Taylor whose myriad marriages drew lots of attention from the media. Though Larry is no more, the tale of the events of his life, what caused them and what they resulted to will always be an interesting piece to read anytime. How about we tell you that story right way including his death and what caused it? Read on to get the details. Bio – Who Was Larry Fortensky? On the 17th of January 1952, Larry Fortensky was born in Stanton, California, the United States of America as the eldest of seven children born to his working-class parents – Harold ‘Pete’ Fortensky and Dorothy Fortensky. As a young child, his parents enrolled him at Pacifica High School located in Garden Grove, California where he studied up to his 10th grade before opting out. Larry thereafter enlisted and got drafted into the United States Army in 1972 but three months later, he got discharged. Following his discharge from the army, he returned home and began working as a carpenter to make ends meet. At around this time, Larry Fortensky got married to his first wife Priscilla Joan Torres with whom he had a single daughter named Julie Fortensky. Two years after their marriage, the couple went their separate ways in 1974. In the course of time – exactly two years later, Larry married the second time to Karin McNeal but by 1984, he also called it quits with his second marriage in 1984. From this point onward, the rest of his life was mostly characterized by his drinking problems and drug abuse. In 1987, he was arrested by the police after he was discovered in a parking lot in San Clemente, California. Fortensky who was totally sloshed also had marijuana in his possession. He was charged for this and afterward he admitted that he really had a drinking problem. It then happened that while he sought for help in a rehab home, he met Elizabeth Taylor whom he instantly felt a passionate attraction to that was also mutual. The rest of the events in their lives is what changed Fortensky’s life from being known as a construction worker to being the husband of a television star. It is not often that people get to meet their life partners at rehabilitation centers, but in the case of Larry Fortensky and Elizabeth Taylor, it was right on the grounds of Betty Ford Center residential treatment center in Rancho Mirage, California that the seed of their love germinated. While Larry was in the rehab home for his drinking problems, Elizabeth, on the other hand, was there to address her issues with pills. The duo quickly began a relationship which was fanned fervently by the intense admiration they had for each other. However, though everything between them seemed right in their own eyes, when and after they left the rehabilitation home, their public show of affection soon began to draw attention owing mostly to the two-decade age gap between them. Taylor was a good looking 56-year-old lady at the time, while Fortensky was still bubbling at 36. Despite the age difference, the pair waxed stronger in their relationship and on October 6, 1991, they walked down the aisle as husband and wife at the Michael Jackson’s Neverland Ranch in Santa Barbara County, California. In attendance at the wedding were celebrities like Eddie Murphy, Michael Jackson, George Hamilton, Macaulay Culkin, Franco Zeffirelli, and about 160 other guests. The nuptials reportedly cost about $1.5 and $2 million. While it seemed that it was love and absolutely nothing but love that brought Fortensky and Taylor to say “I do” to each other, it appears that there was something more to the marriage for Larry Fortensky. He signed a prenuptial agreement with the actress that promised him $1 million should he remain married to Taylor for 5 years. They were indeed married for 5 years and a month. After 61 months of being married, Fortensky opted out of the marriage on October 31, 1996. His sister, Linda Untiet disclosed that her brother no longer wanted to be seen as “Mr. 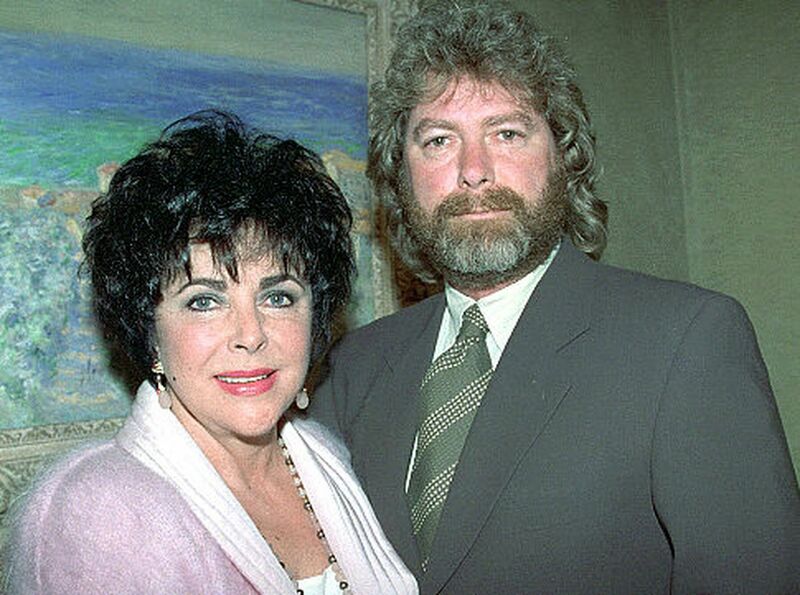 Elizabeth Taylor.” Despite their divorce, the two remained good friends afterward. On the 29th of January 1999, Fortensky fell down from a flight of stairs in his San Juan Capistrano, California home. He was reportedly mourning the death of a dear pet at the time. As a result of the fall, Larry was in a coma for six weeks and after he woke, he stayed back at the hospital for two months before they discharged him. He suffered short-term memory loss till his death on July 7, 2016, following complications from a skin cancer surgery.